A Kisan Mukti Sansad (Farmers' Freedom Parliament), held in New Delhi after completing Kisan Mukti Yatra of more than 10,000 kilometers under the leadership of the All-India Kisan Sangharsh Coordination Committee (AIKSCC) in 19 states, saw its leaders introducing a draft Farmer’s Freedom From Debt Bill, 2017, seeking it's approval in the winter session of Parliament. Held on November 20, since morning, thousands of farmers started marching with flags and sloganeering from Ramlila ground, Ambedkar Bhavan, Gurudwara Rakabganj and different railway stations to reach the Sansad venue at Parliament Street, carrying red, green, yellow and blue flags. The Sansad started with paying tribute to the farmers martyred in Mandsaur and other police firings, to farmers who have committed suicide, and to farmers of Yavatmal, who died due to pesticide poisoning. VM Singh, convener of AIKSCC, welcoming the farmers who arrived for the Sansad, said that farming has become a loss making activity. Ironically, his views echoed the government view that, as farm incomes were declining, more and more people should shift from agriculture to industry. Singh, however, said, the solution lay in farm loan waiver and doubling farmers' income. "All the previous farm loans must be waived off", he insisted. Kavita Kurungati, a woman farmer, and convener of the Alliance for Sustainable and Holistic Agriculture (ASHA), put forward the issues of women farmers in detail and emphasized on the need of passing the bill for loan waiver and ensuring that the price of farm produce is raised at least by 1.5 times of the input cost. Several women related shocking stories of the families of farmers who have committed suicide. They felt for the first time someone is listening to their grievances and were hopeful that in future other families would not commit suicide but would resist for their demands. 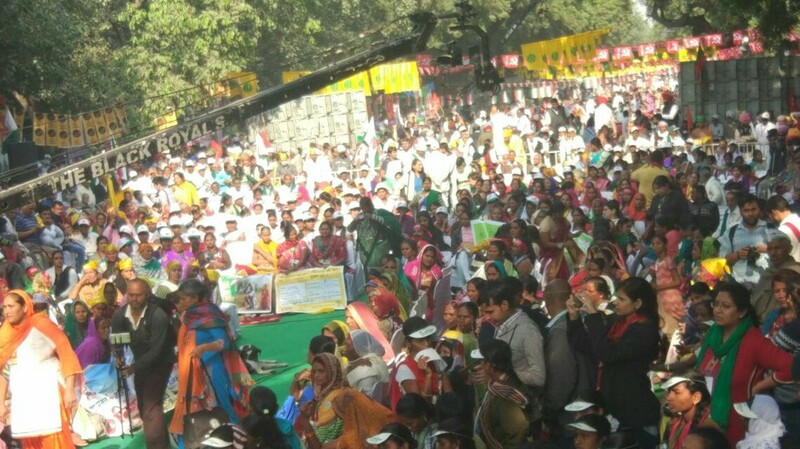 While addressing the Sansad, Medha Patkar of the Narmada Bachao Andolan said that this was a historic moment, as women from all over the country had gathered there to discuss their issues, supporting the bill aimed at bettering the lives of farmers, peasants, farm workers, adivasis, landless, tenant farmers, fishworkers. She added, the government has displaced more than 10 crore farmers from all over the country, including farmers of the Narmada Valley, without complete rehabilitation. Hannan Mollah, president of the All-India Kisan Sabha (AIKS), reading out the Farmer’s Freedom From Debt Bill, 2017, said that the government has looted farmers by paying them less continuously, and forced them into debt. This in turn has caused the suicide of more than 5 lakh farmers in the country. "Farmers will not allow the exploitation now", he said, adding, "Farmers' organizations from all over the country have consistently demanded loan waiver. Here we have a draft bill, which Parliament must discuss and approve. Small loan waivers cannot work for farmers, we need a comprehensive bill to ensure freedom from debt cycle." Raju Shetty, MP, said, "We will not spare anyone found cheating farmers. We have the capability to overturn the ruling government. It is only because of farmers' faith that Narendra Modi was able to come with clear majority on the promises of raising farmer’s income to minimum 1.5 times of the cost." 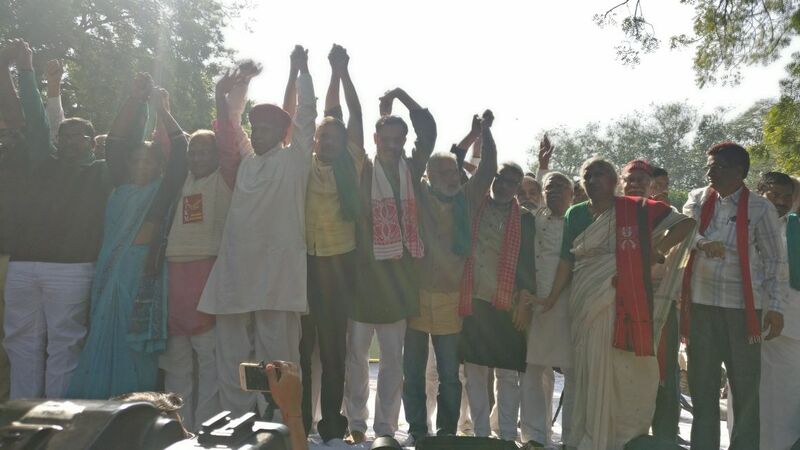 Yogendra Yadav, of the Jai Kisan Andolan and Swaraj Abhiyan, said that the Sansad was a milestone in the history of farmers’ movements. "This is the first time when farmers bearing red and green flags have come together. And with yellow and blue flag bearers also joining in, it has become a rainbow." Atul Kumar Anjan of the AIKS said that corporates are looking towards corporatization of farming looking at the need for seeds, fertilizers, pesticides etc., adding, the narrative propagated by the government and a few economists about less production due to small and medium farm size is totally false, as 54% of wheat production and 57% rice are being produced from these small and medium farms only. Butta Singh Burjgil of the Bhartiya Kisan Union said that the Congress in Punjab had promised to waive off farmers' loan in its manifesto, "and following our struggle, it waived off crop loan of farmers having land less than 5 acres, but put a cap of aggregated crop loan, including principal amount and interest, of Rs 2 lakh. Even here, the waiver is only for those farmers who have taken loan from cooperatives. This comes to less than 10% of farmers indebted in Punjab." V Venkat Ramiyaa, a senior organiser of the Sansad, said that the government had promised to double the income of farmers, but in reality it is keeping the support prices lower than the actual cost in the case of nine out of 17 crops, for which the scheme is offered. "This is pushing the farmers into debt trap. Hence the demand for comprehensive loan waiver." Dr Sunilam, national convener of the National Alliance of People’s Movements, said, "Due to GST and demonetization, already, the farmer’s income are on decline. In the last three years, public sector loans have increased to Rs 10.65 crore from 8.11 lakh crore. This is happening when farmers have raised the production of fruits, vegetables, and crops by 1.5 times to 534 crore tons in the last decade". During the Sansad, speakers demanded unconditional and immediate release of Akhil Gogoi, leader of Assam's Krishak Mukti Sangram Samiti, who is imprisoned for the last year under sedition charges and National Security Act. Speakers called it murder of democracy and dissent, deciding to form committees in states to fight for the release of Gogoi. 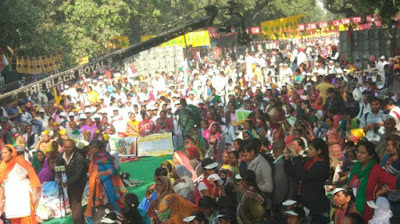 In all, representatives from 184 farmer’s organizations from 25 states participated in the Sansad.